In 1869 and again in 1871, John Wesley Powell made his historic descent of the Green and Colorado Rivers. Follow in his footsteps as these rivers forge their way through 170 miles of awe-inspiring scenery through Labyrinth, Stillwater and Cataract Canyons. You’ll follow the rivers into the untouched heart of the majestic red rock wilderness of Canyonlands National Park, enjoying the pristine beauty of remote canyons, Ancestral Puebloan ruins, petroglyphs, pictographs and fascinating geology. The Green River and Colorado River are both born of snow pack high in the Rocky Mountains. The Colorado is mostly undammed above Cataract Canyon; thus, varying water levels at different times of the year provide a whitewater experience for everyone. Seasons experiencing average and/or above average snow packs will likely see high water in May and June. Outside of high water, it is a great family-friendly run, with less intimidating rapids suitable for most ages and levels of experience. We’ll meet at 7:00 PM at The Gonzo Inn in Moab for a pre-trip meeting. This is an opportunity to meet your fellow travelers and guides and ask any last-minute questions. Your guides will give you a thorough trip orientation and pass out your waterproof river bags so you can pack your belongings that evening. 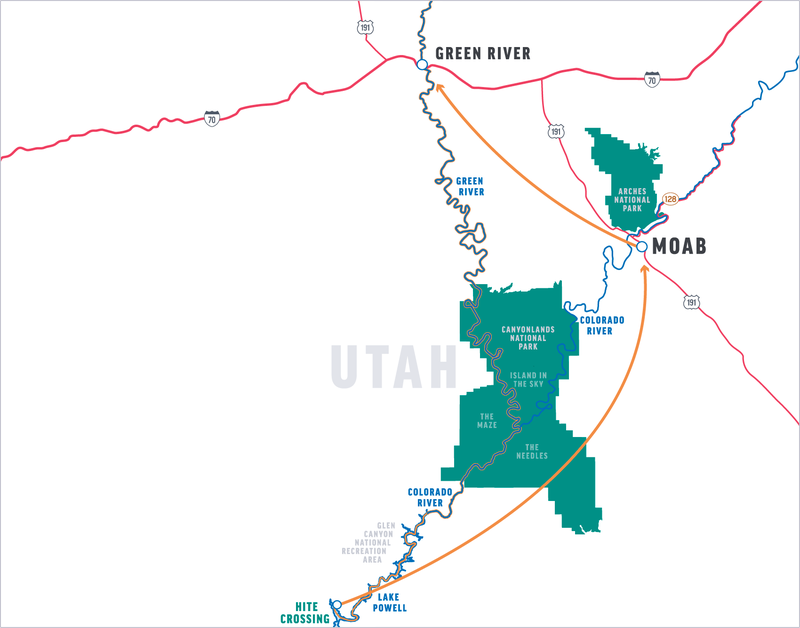 We begin our trip with a scenic drive from Moab to our put-in at Green River, where we will enjoy a delicious lunch prepared alongside the beautiful Green River. Enjoy the food, chat with your guides and fellow adventurers and prepare for the journey ahead. After a thorough safety talk, our adventure starts as we head down the Green River towards Labyrinth and Stillwater Canyons. Mid- to late-afternoon, we stop and make camp. You’ll grab your bags and set up your tent while the guides take care of the kitchen and “living room”—camp chairs and possibly the night’s campfire (if permitted). This is the perfect time for you to lounge on the beach with that book you’ve wanted to finish forever. Before long, you’ll be savoring pleasing hors d’oeuvres and the beverage of your choice—delicious as these refreshments are, they always taste better after a day on the river! Nap, take an exploratory hike, or just sit back and laugh with friends and family as we prepare dinner. Our days begin as the morning light paints the canyon walls with brilliant shades of desert colors. Fresh coffee and tea are waiting for you when you get up; grab a cup, sit back and take in the glory of the awakening river. Soon breakfast is served, and once you’ve eaten your fill, you’ll pack up your things as the guides break down camp. Then our new day’s adventure begins! Reaching Labyrinth and Stillwater Canyons, we may explore many magnificent gorges in side canyons such as Three Canyon, hike up to the River Post Office or discover the secrets hidden in Two Mile Canyon, Fort Bottom, Shot, or Water Canyon. After hearty lunches and thrilling rapids, we might stop to hike to ancient granaries or thousand-year-old ruins and intriguing petroglyphs. During the evenings, we will make camp on beaches or next to cottonwood groves that often allow access to great hiking trails. If our guides don’t arrange a hike, you may want to enjoy a self-guided walk, or perhaps you’d rather just relax and wait for dinner — always a trip highlight, as the day’s adventures stir up a hearty appetite. The group dynamic of our trip is at its best as we gather around the camp “living room” for nighttime conversation and laughter. After the Green winds us through convoluted twists and turns we happily reach the Confluence. Now that the waters of the Colorado River join our party, Cataract Canyon begins, hinting at the whitewater to come. In a slow mix, the murky waters of the Colorado take some miles before they concede to the clearer Green. As we leave Stillwater Canyon, the Green’s 300+ mile journey from Wyoming continues on what is now the Colorado, mightier than before. Our anticipation grows. Next up are the legendary rapids of Cataract Canyon like Mile Long, Capsize and the Big Drops – this section offers plenty of excitement. As we drop into Brown Betty Rapids, the preceding days’ anticipation of Cataract explodes in cool water and huge smiles. Whatever the water level or the type of boat you’re in, the rushes of adrenaline with each new rapid are balanced by the knowledge of your guides’ experience and focus on safety. Between the thrills, ask your guide to tell the tale of John Wesley Powell’s historic 1869 first descent through these formidable rapids. On the last day, Cataract Canyon ends as we reach the old location of Hite that was flooded by Lake Powell. As we journey out on the reservoir toward Hite Crossing, it’s tough not to imagine the wonders drowned below us. What more could Glen Canyon have shown us! The bittersweet ending is now here. Thankfully, the scenic flight back to Moab grants a bit of time to reflect on our epic journey tracing John Wesley Powell’s footsteps. The day before your trip we will meet at 7:00 PM at The Gonzo Inn in Moab, UT for a pre-trip meeting. Your trip leader will provide a thorough trip orientation and pass out your waterproof bags so you can pack your belongings that evening. The trip leader will also reconfirm the meeting time for the following morning and give you an opportunity to ask any last-minute questions. Your return time to Moab will be between 4:00 and 6:00 PM. The Green River is calm before merging with the Colorado River in Canyonlands National Park. The Colorado River is not damned above Cataract Canyon and can exhibit extreme variations in water level at different times of year, providing a whitewater experience for everyone. In the high-water season of May and June, experienced whitewater enthusiasts delight in the huge waves and the famous “Big Drops,” which at times can make even the Grand Canyon’s Lava and Crystal Rapids seem tame. This is some of the biggest navigable whitewater in the U.S. at peak flows. During the fall months, as the water levels drop, this becomes a more moderate run with less intimidating rapids, suitable for most ages and levels of experience. Oar rafts are our “bread and butter” craft and carry the bulk of the gear on most of our multi-day adventures. These capable rafts are used on this Canyons of the Colorado trip when lower flows don’t allow for dories. Your guide pilots the raft with long oars from a center-mounted aluminum frame. Ample space in the bow and stern allows for lounging in calm stretches, while sturdy weight and width give your guide confidence to hit the big waves head-on. Seats 3-5 passengers. Each day varies, but on an average you’ll spend 4-6 hours a day on the boats. The rest of the time will be spent hiking and exploring, eating, or just relaxing in camp. While we will plan multiple guided hikes on each trip, there is ample opportunity for the curious to explore the area at length. Please let your trip leader know if you are an avid hiker and remember to bring extra water bottles and good shoes. Remember however, that all hikes are optional and you can choose to lie on the beach and take in a few tanning rays or read a book instead. Lastly, the Trip Leader must consider to overall ability of the group when deciding what hikes to offer. *The use of drones is prohibited by the Bureau of Land Management on the river. Once you are on the river there is limited communication with the “outside world.” Cell phone service is not available. Our guides carry satellite phones which are strictly used to call out in case of an emergency situation on the river. They can call out, but we cannot call them. Periodically the trip leader will check in with our office. If you have someone that needs to contact you about an emergency at home, they should call our office (800-346-6277). If possible, we will relay the message to you. Keep in mind however, it could be several days or longer before the message actually reaches you. For your family at home you should define for them what you consider to be an emergency and provide them with instructions to call our office in the event one occurs during your vacation. You may want to check one week prior to your trip for an up-to-date weather forecast. We recommend the following website: www.wunderground.com for weather in Green River, UT. The Green River’s headwaters lie in the Wind River Range of Wyoming, and its stream is repeatedly blocked and diverted, most sizably by the Flaming Gorge Reservoir, not far upstream from Dinosaur National Monument. Thus, its flow is determined primarily by reservoir releases, although the Yampa River’s natural flows in the spring impact the Green River greatly as well. The Green River continues on until the confluence with the Colorado River. The flow of the Colorado River through Cataract Canyon is generally unregulated, meaning no single reservoir controls the water level. Peak run-off through Cataract Canyon usually occurs between mid-May and mid-June, but can vary widely from early May and into July. High water trips equate to a more intense whitewater experience and a high level of physical fitness is recommended. Water temperatures are coldest during the high water period and rain gear and warm synthetic clothing will be required. Click on this link for helpful information about packing for your trip: https://www.oars.com/video/pack-river-rafting-trip/. During the day—Wide-brimmed hats are a good choice for sun protection. Ball caps are also useful since they fit under helmets, which are required attire while on our whitewater rivers. Mosquitoes can be bothersome at times in certain areas on the Green and Colorado Rivers, particularly after high water drops. Though this happens at different times every year, it is typically in June. It’s a good idea to come prepared with insect repellent. Long sleeved shirts and pants may be desirable at times. We supply a professionally laundered sleeping bag with liner, a pillow with a freshly laundered pillowcase, a sleeping pad, a ground tarp as well as a shared tent. The complete customized sleep kit that we provide is designed for your comfort and maximizes available luggage space. Our sleeping bags are degree rated depending on the season and are 33” x 84,” which is longer than the normal 80”. At the pre-trip meeting each person will be given one large waterproof bag (approximate sealed size: 13” diameter x 25” tall; 3318 cu in; 54.4 L), for your clothing and personal items. A second bag for your sleeping gear (sleeping bag, sleeping pad, ground tarp, sheet and pillow) will be packed and waiting for you. These two bags will be your “checked luggage” and will only be accessible in camp. Tents are stowed separately. We also provide a small waterproof bag for day use where you can keep items such as raingear, camera, sunscreen, lip balm, etc. (approximate sealed size: 17” tall x 9” diameter; 1081 cu in; 17.7 L). The bags are cylindrical in shape and pack from the top. Please pack light, and keep in mind that river attire is casual: comfort, convenience and boat space take precedence over style. At the end of the trip, you will return to Green River with your waterproof bags, where you will be able to unpack your gear before your trip home.